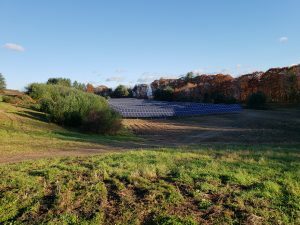 Windsor, VT – Up the hill from the main campus of Cedar Hill Health Care Center and the Village at Cedar Hill (known collectively as Cedar Hill Continuing Care Community), a field has filled up with solar panels. Cedar Hill’s solar array will offset nearly 13 million pounds of CO2, the equivalent of 26 million miles not driven or 153,000 trees planted. “Improving the standards of care and the quality of life has always been part of our mission and we think adding renewable energy improves the living environment for our residents and for the world,” said Cedar Hill co-owner Mary Louise Sayles. The Solar PV system Norwich built for Cedar Hill produces an annual energy value of approximately $100,000 and was only possible due to the federal tax incentives, according to principal owner and founder Mary Louise Sayles. 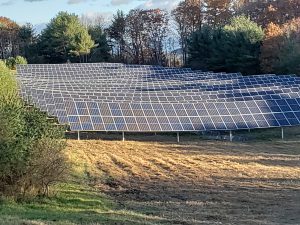 Norwich Solar Technologies specializes in complete end-to-end solar electric services including: Development, Design, Engineering, Procurement, and Construction, Power Purchase Agreements, Structured Financial Solutions and Operations and Maintenance. Our clients include Educational Institutions, Utilities, Municipalities, Commercial and Industrial Enterprises, Farms, Nonprofits, and Small Businesses. Projected Annual Output: 615,000 kWh in the first year of operation. Environmental Offset Equivalents: 13 million pounds of CO2, 26 million miles not driven, or 153,000 trees planted. Jobs Created: 7 full-time job equivalents.